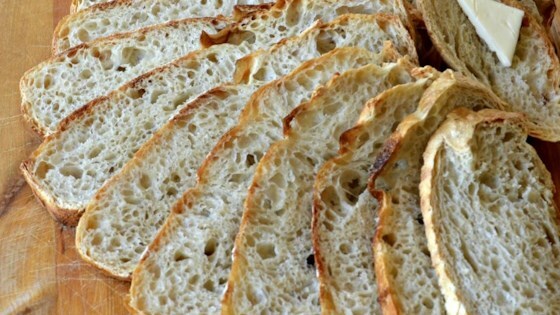 "This is a very easy bread to make without any kneading. Bake in a Dutch oven or heavy casserole dish. The bread comes out very crusty and with huge holes throughout, just like at the bakery." Liberally flour a kitchen towel (do not use terrycloth). Place the dough ball on the floured towel. Cover with another floured towel. Let the dough rise for about two hours [see footnote]. gooey and just did not rise at all. stuck to the dutch oven. takes overnight with unsatisfying results. sorry.